Germany has installed five times as much solar power capacity as the U.S.
(Nanowerk News) Germany doesn’t get an enormous amount of sunlight, relatively speaking. Its annual solar resources are roughly comparable to Alaska’s. 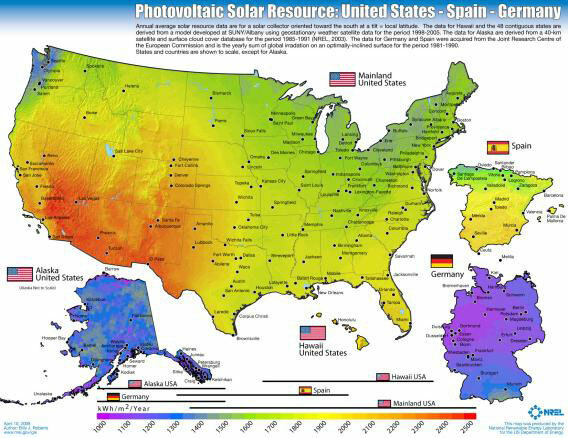 Just about every single region in the continental United States has greater solar potential, on average, than Germany. Yet despite those limitations, Germany has still managed to be the world leader in solar power. At the end of 2012, the country had installed about 30 gigawatts of solar capacity, providing between 3 percent and 10 percent of its electricity. The United States, by contrast, has somewhere around 6.4 gigawatts of solar capacity. Solar installations are also much cheaper in Germany — about half as cheap as they are in the United States. Partly that’s because the industry is bigger. But a recent report from Lawrence Berkeley National Laboratory discovered a bunch of smaller factors, too. Permitting is easier in Germany. And German solar installers spend less on marketing, inspections, and grid-connection fees. That all adds up. Now, there’s a crucial flip side to this story, too: Germany’s renewable-energy splurge isn’t cheap. This year, the average three-person family will likely have to pay an extra $220 on their electric bills to finance all that new wind and solar construction. And German lawmakers have debated whether to pare back the billions in feed-in subsidies for solar power, particularly since it’s a cloudy country and wind turbines are still a much cheaper form of clean energy. Still, there’s no physical reason why the United States couldn’t match or surpass Germany’s solar binge — we certainly get a lot more direct sunlight. (Oremus was rebutting a FoxNews segment claiming that Germany had more solar because it’s sunnier there.) It’s mainly a question of what energy policies the country prefers, and whether or not we want to pay more for solar or other carbon-free energy sources.